A 14 amino acid peptide from the centre of human Caspase-5. Western blot: 1.0 µg/ml - 2.0 µg/ml; detects a band of approximately 48 kDa in Ramos cell lysates. (Predicted precursor MWT 47.8kDa). Caspase-5 has been shown to be expressed at higher levels in the colon, lung, spleen, small intestine and by peripheral blood lymphocytes. 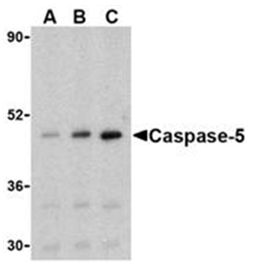 Caspase-5 is a member of a growing number of inflammatory caspases belonging to the Caspase-1 (ICE-type) subfamily, which require proteolytic processing of their inactive precursor into smaller active subunits. Unlike Caspase-1, Caspase-5 is not directly responsible for the activation of IL-1Beta from the pro-IL-1Beta precursor, but the presence of Caspase-5 does appear to enhance the processing of IL-1Beta. The in vivo expression of Caspase-5 is elevated by Lipopolysaccharide (LPS) and gene expression is also increased by Interferon gamma (IFNg). 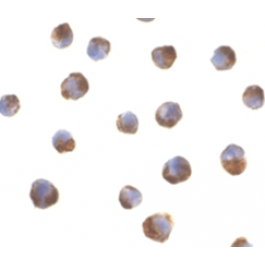 In vitro studies have shown cleavage of Caspase-5 by the serine protease Granzyme B, which plays a major role in Cytotoxic T lymphocyte (CTL)-induced apoptosis (1). (A full Health and Safety assessment is available upon request) This product contains sodium azide: a POISONOUS AND HAZARDOUS SUBSTANCE which should be handled by trained staff only. Antisera to human Caspase-5 were raised by repeated immunisation of rabbits with highly purified antigen. Purified IgG was prepared by affinity chromatography. 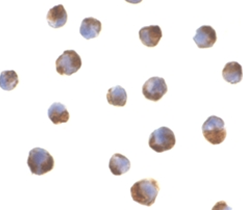 This antibody recognises an epitope located within the internal region of human Caspase-5, a 47kDa cysteine protease, otherwise known as ICH-3.